I'm going to share something not a lot of people know about me. As you probably do know, I run this beautiful company made up by about a dozen women, which I started in 2010 after a few months of being new to veiling. 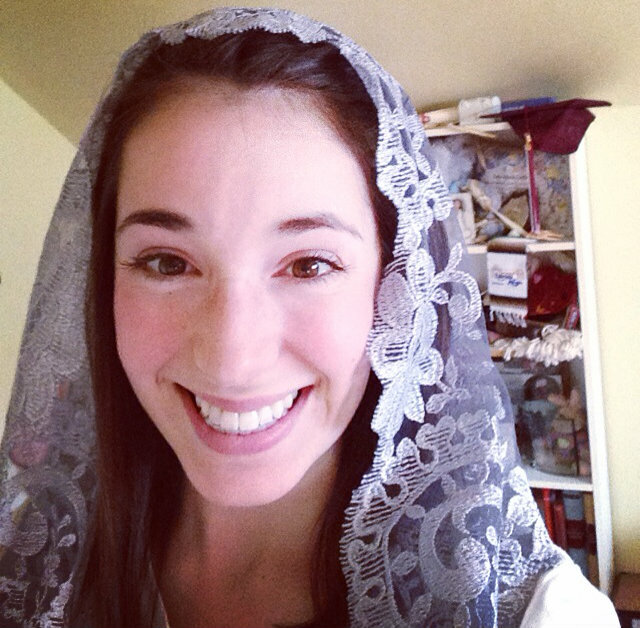 When I started veiling, some thought me very "brave" for being willing to wear a veil at a parish where no one else did. "Oh, I love your veil and would love for the veil to come back...but I couldn't do it," people would say. "I just couldn't stand out like that." Brave? I just shook my head and smiled. Little did they know, in my heart there was a furious battle going on. My love for God told me it wanted nothing more than to give myself completely to the God who has loved me to the end, and to have my veil as the sign of that gift of myself. My vanity, though, was repulsed at the thought of other people thinking I was trying to be "holier than thou." I knew I struggled with vanity. My world had come crashing down when one of my best friends had revealed to me what she really thought about me. Quite honestly, I didn't know how I could bear the thought of another human being thinking anything other than wonderful things about me. So when my friend Elaine (the same one who introduced me to veiling) told me veiling would be a wonderful mortification of my vanity, I knew, in the depths of my heart, that I wanted to do it. Now, some people believe that a beautiful lace head covering invites the heart to vanity, but what they don't realize is that standing out, in itself, is so mortifying, that any hints of vanity because of the pretty lace are violently crushed at the thought of someone's negative judgment. Let's face it: the most common reason we dress nicely, put on makeup, and do our hair, is to obtain the admiration of others (vanity). If this gorgeous lace, despite being gorgeous, invites the contempt of others, then it actually opposes vanity. Sure, you might say that this assumption that others would judge us is actually quite uncharitable, but when you're like me and struggle with vanity, there is little that can convince you otherwise. All you're thinking about is, "They're judging me, they're judging me, they're judging me." Here's the kicker, though. The saints teach us that the best way to overcome a vice is to practice the opposing virtue. So if I won't veil because I don't want to be judged (vanity), I should veil and thus kick that vanity aside. I said to myself: if I really love God, I will let go of the opinions of men. The thing that matters is that my heart be firm in the knowledge of the love of God, because if I have that, then what else do I need? And that's precisely the point. Humility does not mean saying, "I am the worst of all people." That's comparing yourself to others. No, the point of humility is realizing who we are in relation to God. Humility offers us a more difficult challenge; it compels us to seek the glory of God rather than ourselves. The focus of humility—the reason that humility is a virtue—is God, and our relation to Him. It is about seeing who I am, and seeing who you are, in light of our Creator. When we are willing to let go of the opinions of others, we are telling God that we want Him to be our everything. As it should be. When we see how He was loved us and how ungrateful we have been in response to such amazing love, there no other fitting response. P.S. If you do struggle with vanity when wearing a pretty veil, the best thing you can do is choose a rather plain one, or save the nicer ones for special feast days. Related: Chapel Veils: Shouldn't We Avoid Drawing Attention to Ourselves?, Vanity, Vanity... Does God Really Need to See a Veil to Recognize Piety?